Close by to where Mick and Lindsay live is the city of Elche. It is the third most populated city in the Community of Valencia (after Valencia and Alicante) and the twentieth largest Spanish city. I would never have guessed that. The twentieth largest city in the UK is Nottingham and I have heard of that of course and in USA it is El Paso, Texas which surprised me. 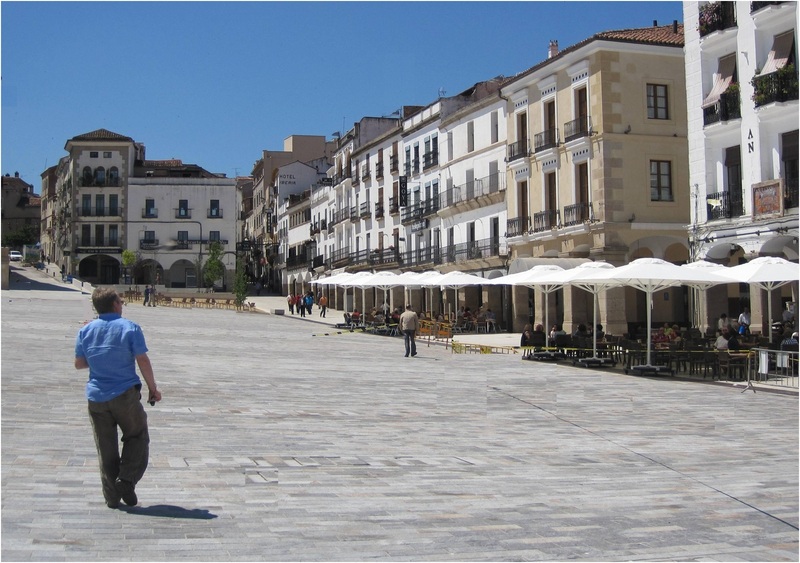 In Australia it is the splendidly named Albury–Wodonga in New South Wales. 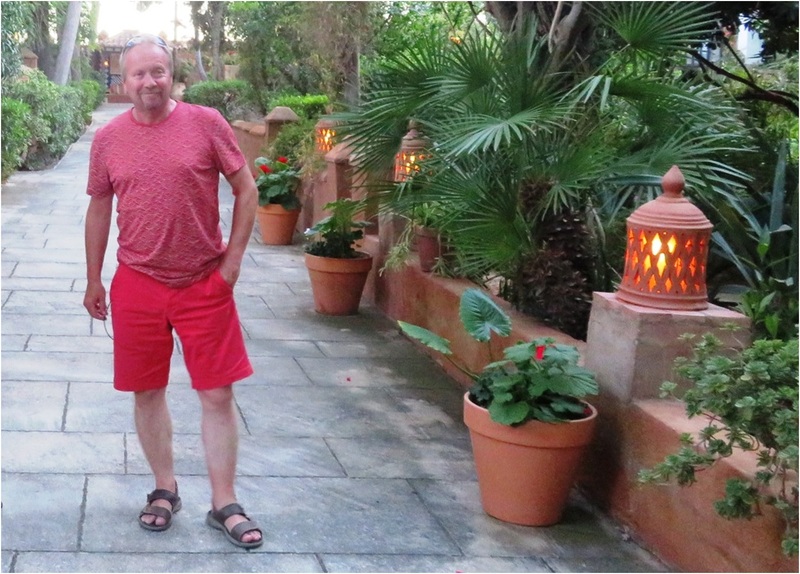 The two main reasons for visiting Elche are to buy a pair of shoes (footwear manufacture is the largest industry in the town) or to visit the Palm Forests which are a UNESCO World Heritage site. 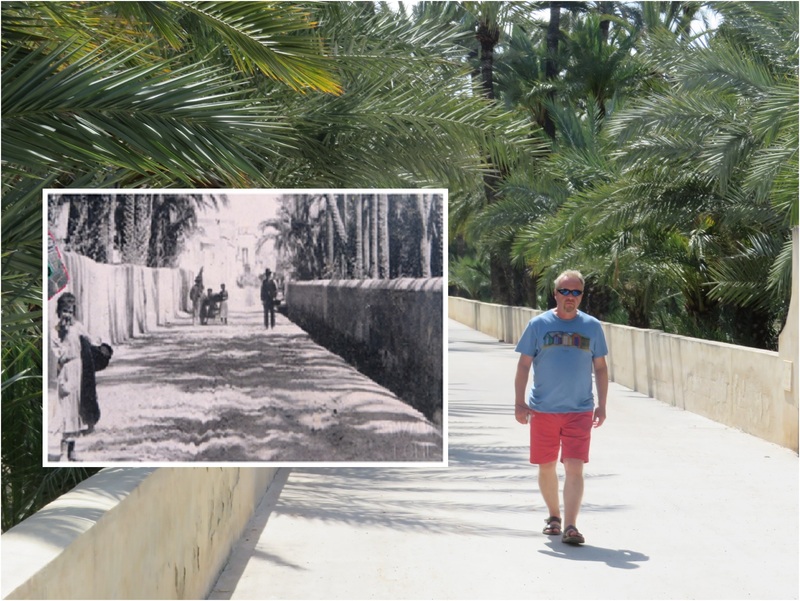 No one needed a new pair of shoes today because we had been shopping the day before and been in every shoe shop in La Zenia so today we were visiting the date palm orchards which date way back to the time of the occupation of Iberia by the Moors of North Africa. 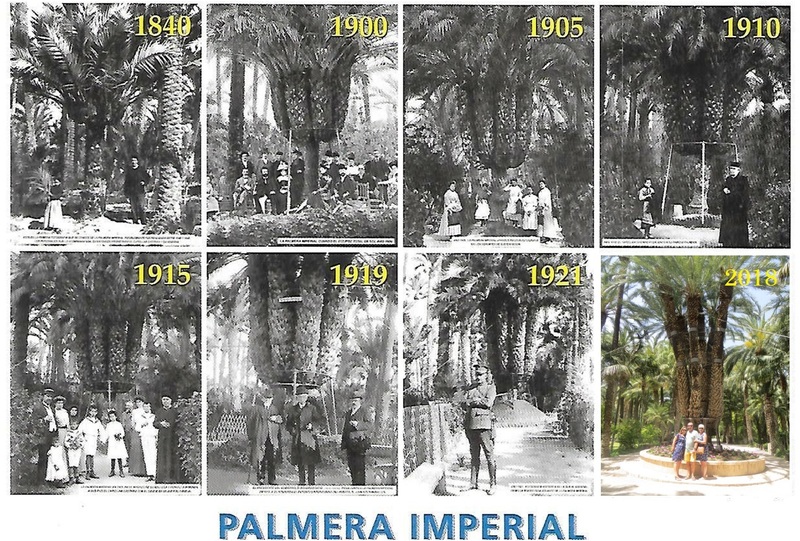 In 2000 UNESCO designated the Palm Grove as a World Heritage Site citing the transfer of landscape and agricultural practices from one culture and continent to another – Moorish North Africa to Christian Europe. 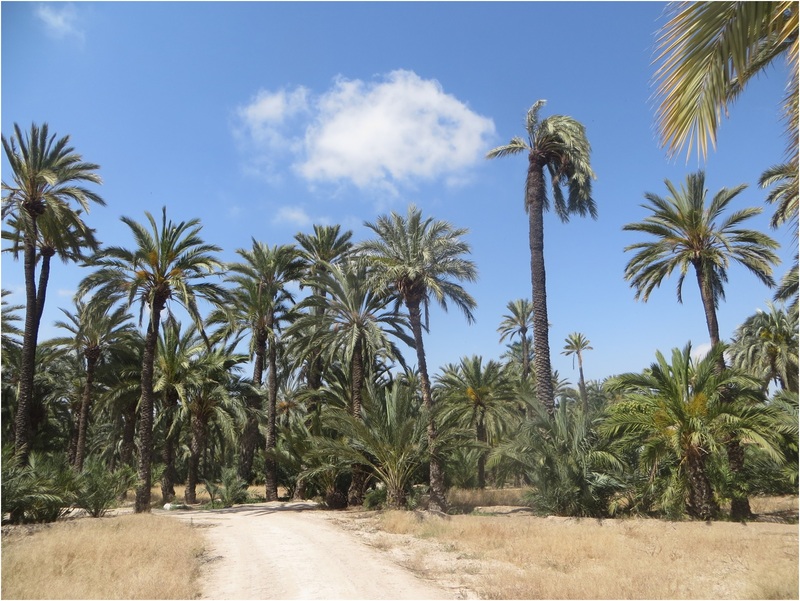 Currently, in the urban area of Elche there are almost one hundred different orchards containing about seventy-thousand date palms mostly in the east bank of the Rio Vinalopó. This number however does not include other large plantations located around wider urban area and all together the number may be close to a staggering two hundred thousand palms. It is the only palm grove of its type anywhere in Europe, the northernmost of its kind and one the largest in the world outside of North Africa. Individual specimens of the palm trees can grow to a height of more than one hundred feet and be up to three hundred years old. For statistical reasons I now digress. 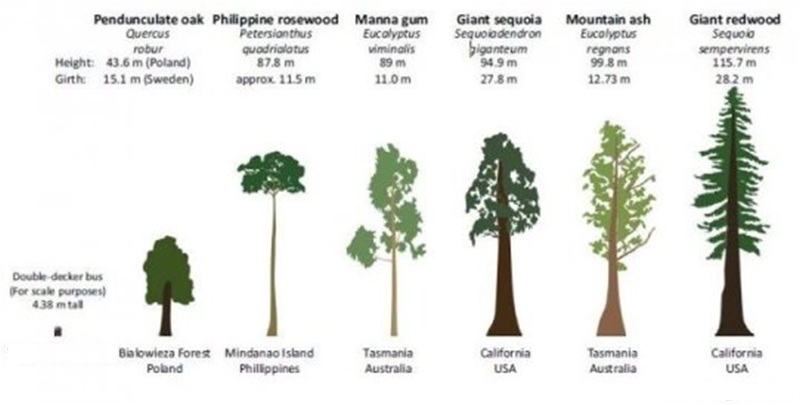 The tallest trees in the World are the Californian Giant Redwood which grow to nearly four hundred feet, in Australia there is a species of Eucalyptus (Mountain Ash) which gets to three hundred and thirty feet and the tallest trees in the UK are the Douglas Fir which by comparison struggles to get to just two hundred feet or so. The iconic English Oak (which we always think of a tall tree) is left way behind at only seventy feet! 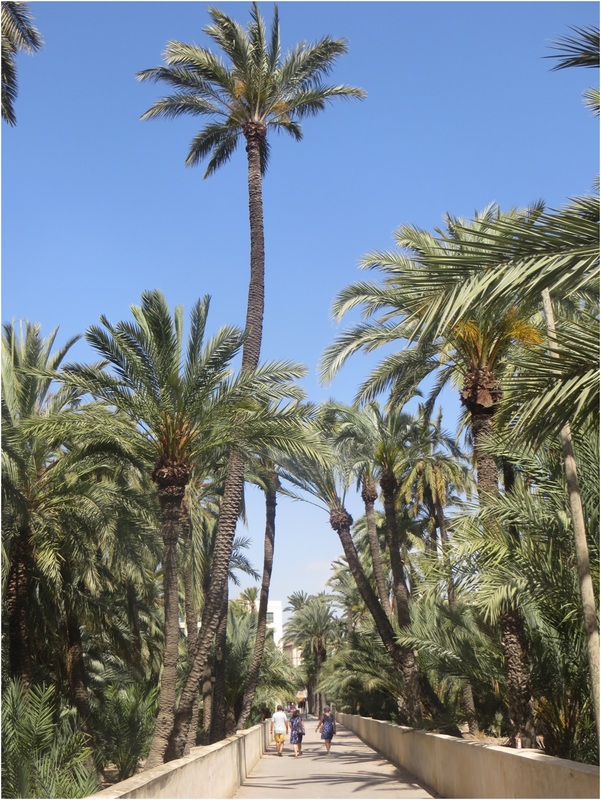 We arrived in Elche at mid-morning, found a convenient parking place and wandered off towards the palm forest, none of us thought about noting down the name of the street where we had left the car! Very quickly we were in the first orchard, a carefully managed public park with winding footpaths and clear direction signs but not very long after that we strayed into a less well managed area with winding dusty paths and not so many direction signs. Soon it became clear that we were losing our sense of direction and as anyone who has been in a palm forest will know one palm tree looks very much like all the others because there isn’t a great deal of variation in shape or form. We wandered around a little more getting ever further from our starting point and with realistic hopes of following the same route back rapidly deteriorating and it was at about this point that it suddenly occurred to us that we weren’t absolutely certain about where we had started from anyway. Eventually we came across a busy road and close by a public park where there was an entrance fee to see the palms. Having just seen about a thousand palms for free I wondered if this was necessary expenditure but we paid up and went inside and we were glad that we did because the gardens were immaculate and there were several interesting palms in there including one known as ‘Imperial Palm’ with seven stems in the shape of a candelabra and estimated to be about one hundred and seventy-five years old . It was named after Elisabeth, the Empress consort of Franz Joseph of Austria, who visited the plantation in 1894. The visit over we made our way to the city centre but finding it to be a modern concrete sort of place with little really to interest us, it seems that most of the historical centre has been demolished and cleared away, we turned our attention back to the issue of finding a way back to the car. We were still surrounded by a forest of palm trees on all sides so there was quite a bit of guess work involved here and several disagreements about direction and I always get nervous when Kim assumes the role of navigator because this is rarely good news. I say nothing of course. As it happened Mick had the keenest sense of direction, overruled all of our panic suggestions and insisted on a route that soon got us back to the car without any further detours. 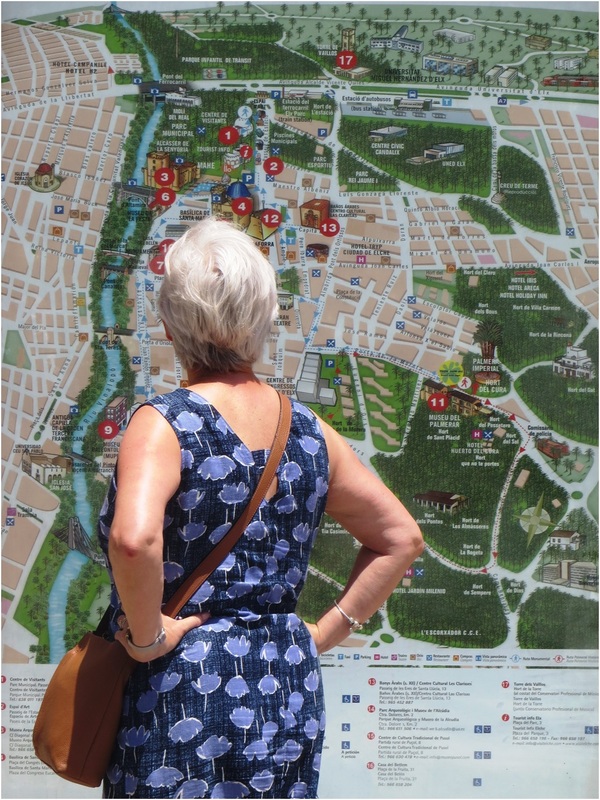 In several previous travels to Alicante and the east coast of Spain we had visited much of the coast and the obvious places to go and see so today we set out to do something different. I didn’t really have shopping at the top of my travel itinerary but you have to give and take sometimes and Kim and Lindsay wanted to go and look at sparkly things so we spent the morning at a modern mall at the town of La Zenia. I didn’t do a lot of shopping I have to say, just wandered about a bit and found somewhere for a drink as the girls enjoyed a frantic two hours or so in the shoe shops. Later that day we eventually did something quite different. 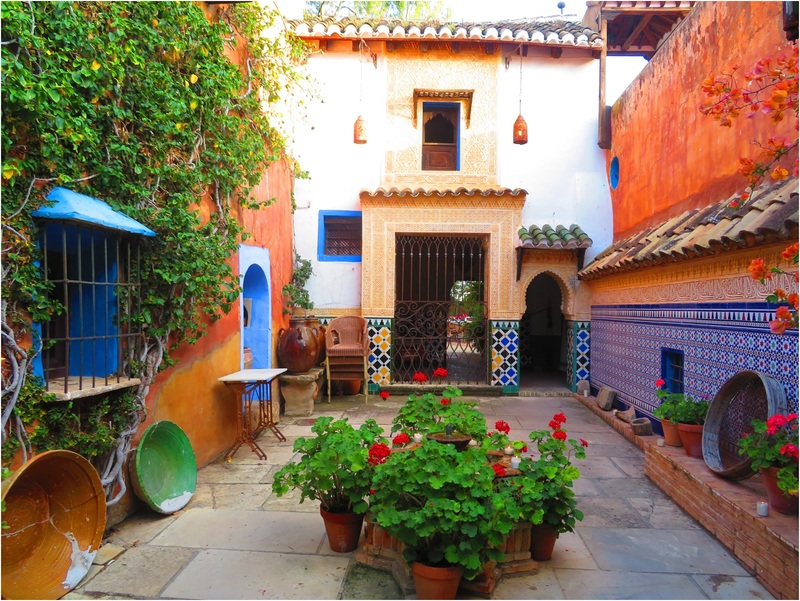 Mick and Lindsay knew of a secret place at the foot of the mountains inland, Moroccan Tea gardens called Carmen del Campillo the ‘Casa Morisca’. 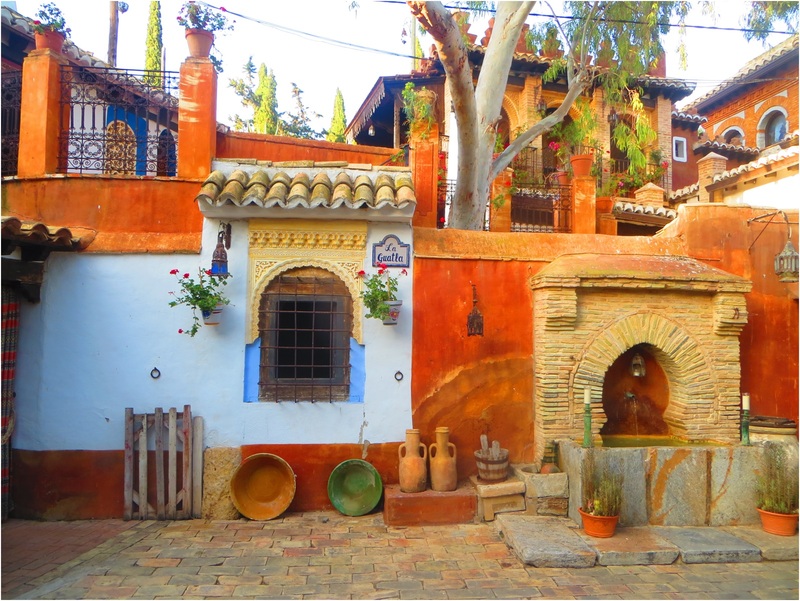 This it turned out is an unexpected and enchanting place with echoes reminiscent of Moorish Spain. The description Moors derives from the Latin Mauri, a name for the Berber tribes living in Roman Mauretania, modern day Algeria and Morocco. 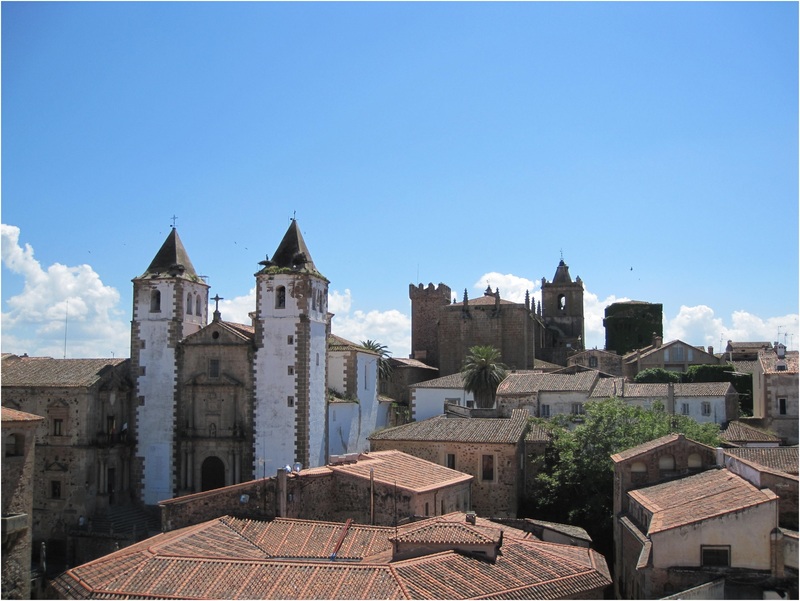 It has no ethnographic meaning but can be used to refer to all Muslims, Berber or Arab, who over a thousand years ago travelled north out of Africa and colonised the Iberian Peninsula. 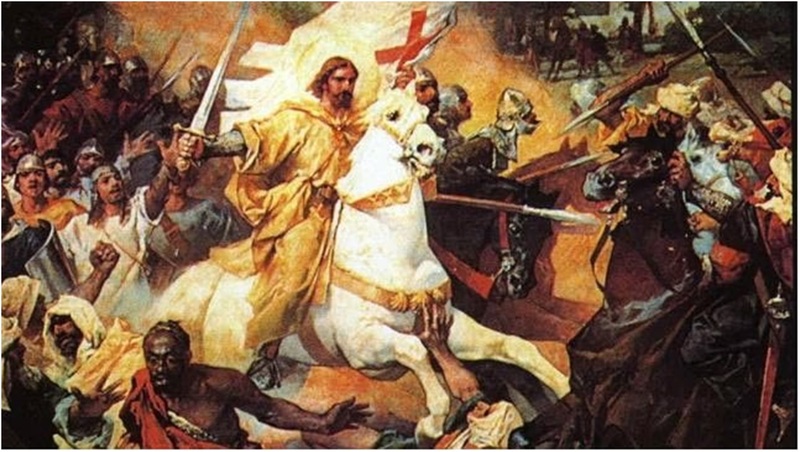 The Moors arrived in Iberia in the year 711 and began a period of history which would give Spain a different and unique history to the rest of Europe as the entire region adapted to a new religion, language and culture. The period of Moorish occupation was to last nearly four hundred years and normally I would look for palaces and castles as a reminder of this time but in the Levante you have to look at the countryside because the Moors created the landscape of the region. They expanded and improved Roman irrigation systems to help develop a strong agricultural sector. After the irrigation they planted citrus groves and peach and almond orchards. 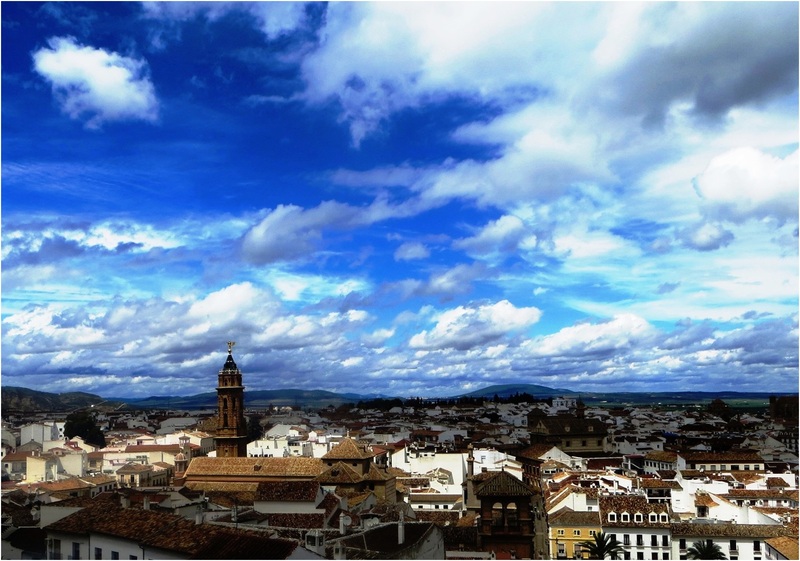 They introduced many new crops including the orange, lemon, peach, apricot, fig and pomegranate as well as saffron, sugar cane, cotton, silk and rice all of which remain some of Spain’s main products today. The terraces on the hillsides throughout the region are an everlasting Moor legacy. There are no olives or vines in Valencia and Murcia just acres and acres of fruit that stretch as far as the eye can see. In holiday brochures this might be the Costa Blanca or Costa Calida but it has a less well-known alternative name – the Orange Blossom Coast which owes its name to the sweet smell of citrus that hangs in the Spring air. Spain is Europe’s largest producer of oranges and two-thirds of these little balls of sunshine come from the region around Valencia. The millions of orange trees are shiny green the year round, clothed in delicate white blossoms in spring and bright orange baubles in the autumn when each tree groans under the burden of up to five hundred fruits. The Moroccan Tea Gardens are difficult to find and involved a long drive along a dusty track until we arrived at what seems at first sight to be an oasis in a thirsty plain. Getting in is easy enough but I worried about getting out again when the iron gate was closed firmly behind us with a firm jailhouse rattle. 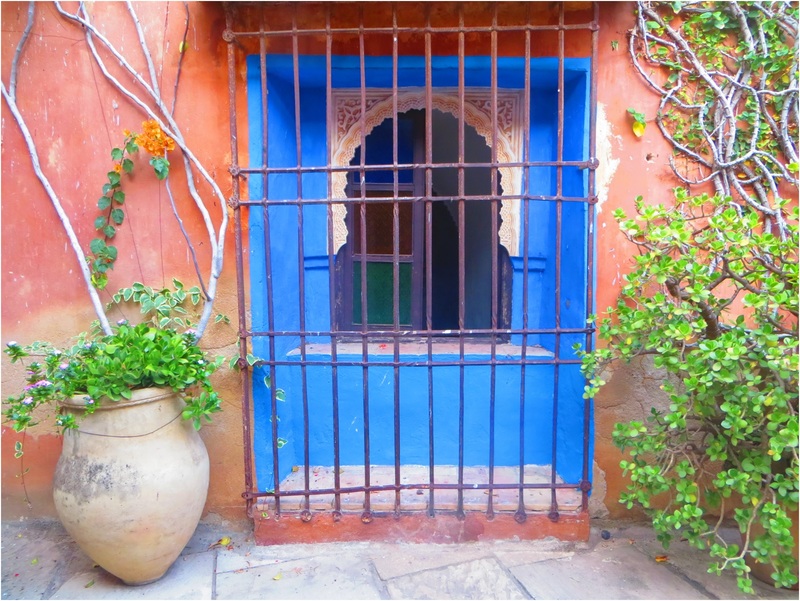 One inside the whole place is a rapturous assault on the senses, the sights, smells and sounds of Morocco, brightly painted walls and decoration, the aroma of burning incense and the music of North Africa. Terracotta pots with effervescent geraniums and boiling blooms. The garden weaving intricately and effortlessly through the house, making it an indoor and outdoor experience all at the same time. The house consists of a labyrinth of rooms that open onto open balconies, sun-bleached decks and private terraces that lead directly to the rooftops. The objective of this tea house is to encourage tranquillity and relaxation and as afternoon slipped into evening it was illuminated with Islamic lamps and traditional wood burning fireplaces in every other room. After we had investigated the house and gardens we found a table and ordered tea and sweet pastries and waited for the sun to disappear behind the mountain range, the Serra de Crevillent and when it had gone and we felt tranquil and relaxed we left the little piece of Morocco in Spain and made our way back to Rojales and the coast.